A familiar view of a couple of London's icons. The skyline at southbank has a familiarity to it yet is always a little bit different. Don't forget to visit other skywatchers this week. Great shot of London, I cannot wait to visit the UK this July. I look forward to checking out your blog often in anticipation of our vacation. Oh Check out that sky! WoW! I love it when the sky looks like that - Very cool shot! Great shot- I remember that London sky well! We were there -by the London Eye and Waterloo Bridge- on our last day in London before moving to NY. It was very cold and the sky looked exactly like that. That's the London that I remember, and love! That's a different view than I have seen before, and it is wonderful! The sky is very gloomy. The sky like this could be anywhere right now, but the Thames view can only be London!! ... and we love it! It looks like a very grey day though I see a hint of pink in the background. So nice, so London! I like the colours in the sky, inbetween a thunderstorm and a snowfall. Have a great weekend. Ciao. A. 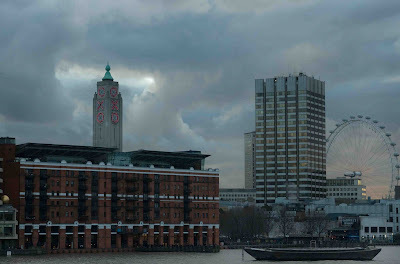 Nice swirling clouds over the OXO building! Lovely capture for sky watch! A great London scene. it is one of my favourite parts of London, always something to see and do or just a nice place to walk. The skyline has changed since I was there but the ominous atmospheric skies haven't. Such a nice shot and great composition. It is such a wonderful experience to see where you are through the eyes of others. Yes, a kind of a London ex-libris. Great shot! This is one of my favourite places in London to spend time, great shot. And there's the eye! I wonder what the view from up there would be like. I love your photos. I visited London this past spring and absolutely loved it! It was a great change from NYC and not only loved all the sights but also the fashion. Great photos! I used to live on the South Bank. Such a great but underappreciated part of the city. Thanks for sharing these. Such great photos - they all have such great composition. Love your blog.